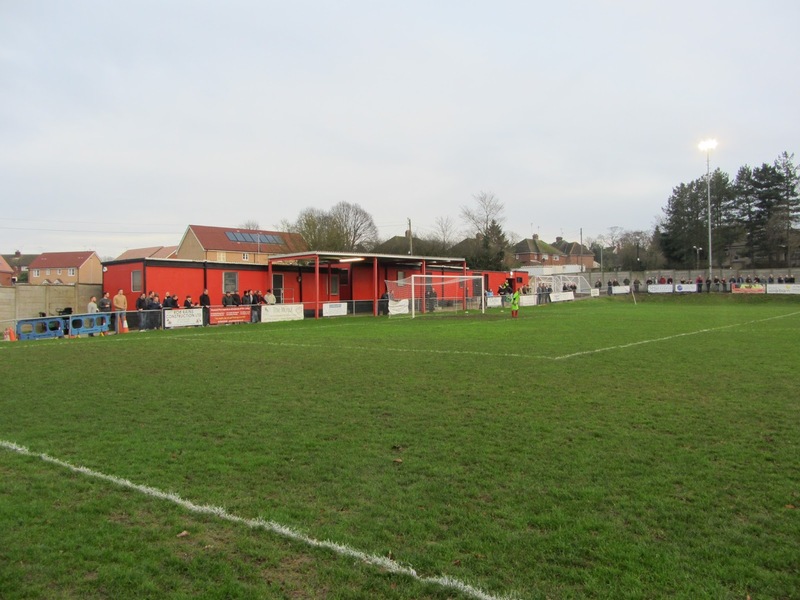 My twenty-fourth ground of 2015 was on Monday 28th December at Catons Lane in Saffron Walden, Essex. 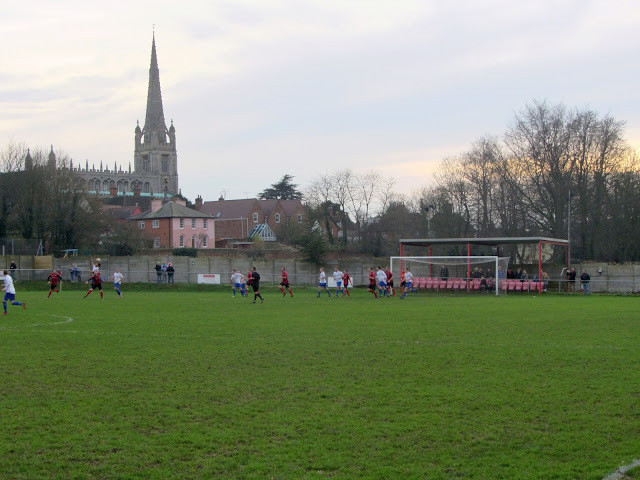 The match was Saffron Walden Town vs. Hadleigh United in the Eastern Counties League Premier Division. Catons Lane is on the northern outskirts of the town and is part of a small sports complex including a mini football pitch, basketball court and playground. The venue is 2.5 north-east of the nearest railway station at Audley End and has been home to the club since 1890. On the south-east side of the ground there is an all-seater stand by the half-way line with three rows of seats built into the grass bank. The 147 seats are split into 3 sections with two 60 seat sections separated by 27 seats in the middle of the stand which double as dugout replacements for the two teams. The stand includes a strip of hard standing directly behind the seats. The rest of this side of the venue is uncovered hard standing. From here the pitch slopes down towards the north-west side of the ground. 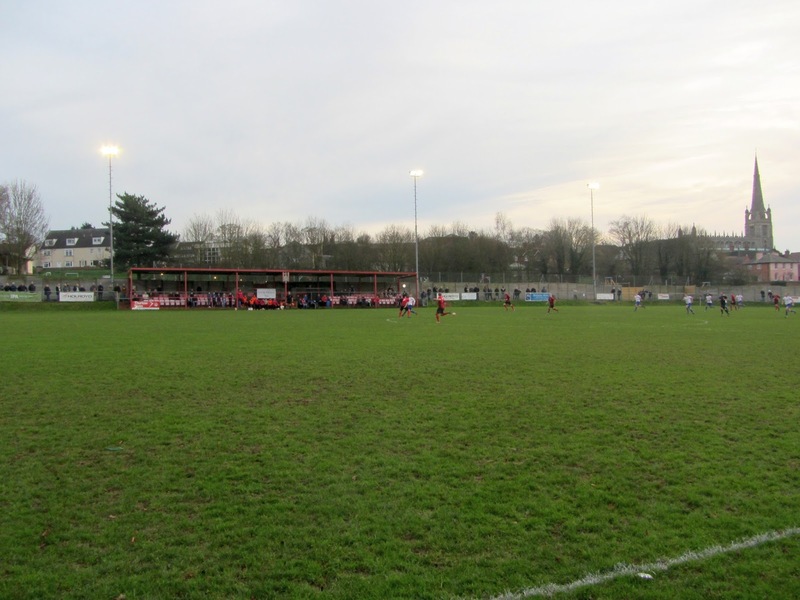 The north-west area of Catons Lane also has a stand by the half-way line which dates back to 1937. This stand consists of three rows of wooden benches with a gangway in the middle leading to the players dressing rooms within the stand. To the north of this stand is a smart clubhouse with a food outlet attached and a building for club officials next to this. The south-west section of the ground is uncovered except for a small stand behind the goal. This structure consists of 40 seats with a flat area behind this and at the back of the stand 4 progressively thinner rows of concrete terracing. The north-east end of the venue is the only area with no seating. Instead a number of demountables take up this area with a roof extending out from these buildings to cover the area directly behind the goal. The top corner of this is where the turnstiles are situated. The game began with early pressure from Saffron Walden but in the 12th minute Hadleigh launched a counter-attack from a home corner and while advancing towards the keeper drew a foul in the penalty area. Danny Thrower's effort found the top corner of the net although the keeper Floyd Croll did manage to get a hand to it. The hosts peppered the Hadleigh goal in the opening 30 minutes but Hadleigh had defenders in numbers and were able to frustrate the hosts. 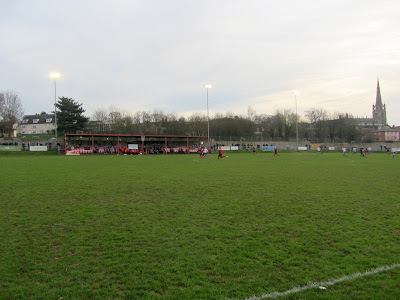 The visitors then went on the attack in the later part of the half and though a 36th minute effort was ruled out for offside they did double their advantage in the 42nd minute after a cross into the box was headed down for Aaron Churchyard to stroke past the goalkeeper from 6 yards out. Hadleigh put themselves in an even more commanding position in the 57th minute when a winger beat the defender down the left-wing and produced a good save from Croll only for David Lorimer to knock in the rebound from 12 yards. Saffron Walden had plenty of time in and around the Hadleigh area in the second 45 minutes but never really looked like scoring. Hadleigh on the other hand were very effective on the counter-attack and looked more likely to add to their total. The visitors missed a couple of good chances in the closing minutes so it remained 3-0.